The new C-Class is really rather brilliant, a fact we established when we drove the C 200 petrol that came. However this here is the big one, the car that is going to cause a lot of worry for the competition and earn a lot of money for Mercedes-Benz. Meet the C 220 CDI. This is a very similar car to the C 200, and from the outside you'll be hard pressed to find any differences. In fact the first challenge is identifying whether you're looking at a C-Class or an S-Class. They really do look very similar and the trick here is zooming out a bit and looking at the scale of the design - if it looks elegant but massive it's an S, just plain elegant and you're looking at a C.
I personally love the way the new C looks; commanding yet elegant which is exactly what any Merc should be. Right from the big grille and striking full LED lamps which are a segment first to the lovely curve over the rear haunches that end in a subtle lip spoiler, this car looks excellent. The rear bumper smartly hides the exhaust pipes away when you walk up to the car but you can see them when you're following the car on the road. What really bowled me over are the interiors. 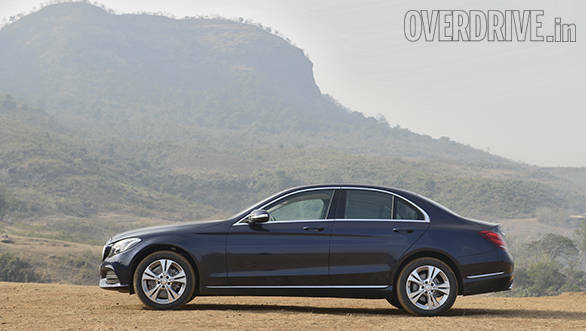 They are strongly reminiscent of the S-Class and that is high praise for any car, let alone an entry level Mercedes. Right from the theme of the design to the colour palette to the gorgeous Burmester speakers, it feels just like being in an S-Class. There's plenty of wood everywhere and the centre console is dominated by a large and crisp high resolution display. The seats are wide and comfy while the rear bench is also comfortably reclined. Rear knee-room has definitely improved over the old car and is on par with its rivals, but it's still no Skoda. I would say that it is decent at best and is one of the few faults I found with this car. The boot is shallow but deep and has a space saver strapped to the floor that eats a considerable amount of space. However having been stuck on the highway overnight, when we had a puncture in one of this car's immediate rivals, I think the peace of mind of having a spare is worth the lost boot space. An 8 second run to 100, loads of in-gear shove and a top speed of just over 220kmph is all the performance you need. 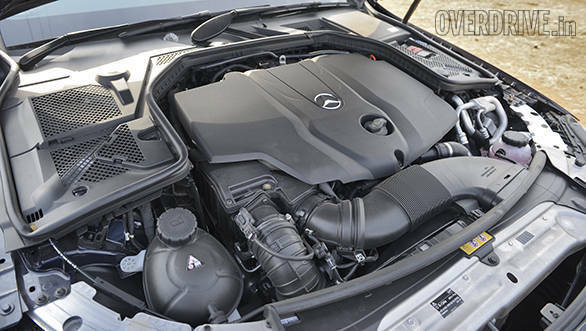 The 2143cc in-line four diesel produces 170PS and the 400Nm is sent to the rear wheels via a 7-speed torque convertor. It's the torque that defines the experience and the car pulls hard enough in the lower gears to firmly push you back into the seats. Alternately, 100kmph in seventh has the engine relaxed at around 1,500rpm which results in a phenomenal 23.7kmpl highway figure which then stays impressively high at 15.4kmpl in the city. We've often complained that this motor is a bit too loud in the lower MFA cars but Mercedes has done an excellent job with sound deadening here. You still hear it and are aware that you're driving a diesel but it's much more refined and NVH levels are quite good even at high speeds with not too much wind and road noise seeping into the cabin. With the performance and economy on offer, you can cruise effortlessly at some serious speeds all day long. Being a Mercedes, you'd expect the C-Class to ride like the wheels are sprung on squishy pillows. Well those days are gone. Today cars with the three-point star are all about the balance between ride and handling. Ride quality is comfortable but with the ever present hint of firmness. It's all fine until you hit a pothole without too much caution which will cause the suspension to thud quite loudly. Overall all though, comfort levels are quite high in most situations. Handling again sits in the middle ground - the car feels planted and eager but still displays some softness at the rear. Still, I found the car quite enjoyable to flog up the Ghats with understeer setting in only when pushed very hard. The electric steering is quick, direct and weights up nicely as you go faster. The car has a toggle switch called Agility Control that allows you to switch between driving modes - Eco, Comfort, Sport, Sport Plus and a configurable Individual. These modes affect steering weight, throttle response, air-conditioning and Sport Plus mode allows a small shimmy at the rear before the electric nannies cut in. Yelling Fight the Power while trying to get sideways won't happen because you cannot fully switch off traction control, even through the COMAND menu. And that's a bit of a shame because there's more than enough torque to make things interesting. The verdict is that this is an excellent car for all the right reasons. It looks smashing and rear space aside I think this has a nicer cabin than even an E-Class. The car is quite comfortable and can also be rather entertaining when you're in the mood. But most of all, the design and luxury really spoil you. It's in the details like the crisp audio system that plays anything from USB to SD cards to streaming Bluetooth and doesn't require you to pay extra for a silly cable to connect a thumb drive to the system. Then there's the lovely circular air-vents that slot back into the centre position with an oddly satisfying click. 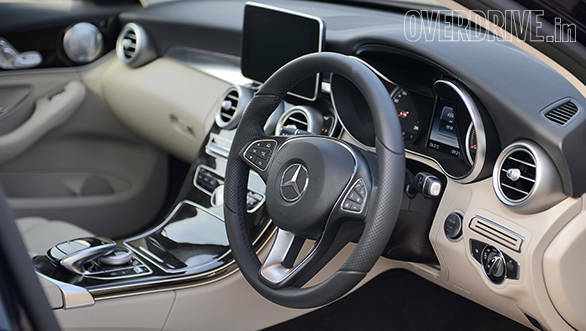 Just like in the S-Class, you can select the interior light colour and intensity but only with a smaller range of choices. 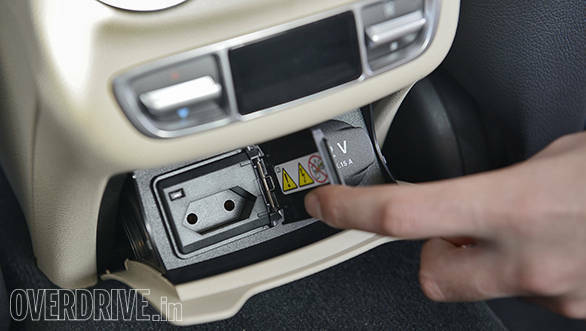 Rear passengers have a choice of either a 12V power socket or a standard two-pin plug socket, another segment first. The car comes with a reverse camera and push button start but I simply cannot understand why there is no keyless entry. You still have to use the key to open or lock the car and all these luxury brands really need to take a lesson from Hyundai or Ford in this respect. 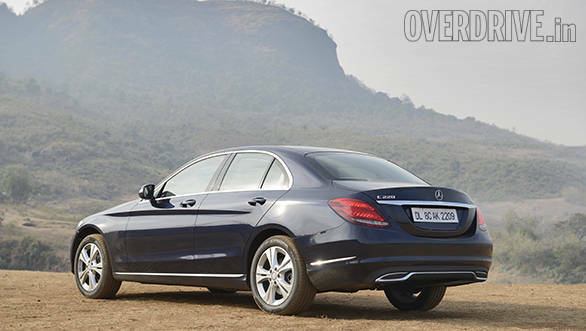 The C 220 CDI , like its petrol sibling, is initially available only as a CBU but in two variants. 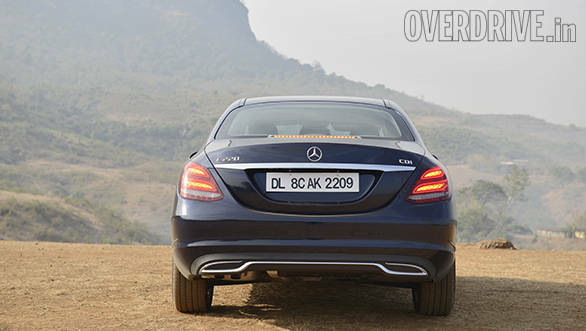 It is priced at Rs 39.9 lakh for the Style variant and Rs 42.9 lakh for the Avantgarde, ex-Delhi. Still, for your money, you get a fine luxury automobile.